Random House Trade Paperbacks, 9780812974010, 304pp. Black Swan Green tracks a single year in what is, for thirteen-year-old Jason Taylor, the sleepiest village in muddiest Worcestershire in a dying Cold War England, 1982. But the thirteen chapters, each a short story in its own right, create an exquisitely observed world that is anything but sleepy. A world of Kissingeresque realpolitik enacted in boys’ games on a frozen lake; of “nightcreeping” through the summer backyards of strangers; of the tabloid-fueled thrills of the Falklands War and its human toll; of the cruel, luscious Dawn Madden and her power-hungry boyfriend, Ross Wilcox; of a certain Madame Eva van Outryve de Crommelynck, an elderly bohemian emigré who is both more and less than she appears; of Jason’s search to replace his dead grandfather’s irreplaceable smashed watch before the crime is discovered; of first cigarettes, first kisses, first Duran Duran LPs, and first deaths; of Margaret Thatcher’s recession; of Gypsies camping in the woods and the hysteria they inspire; and, even closer to home, of a slow-motion divorce in four seasons. 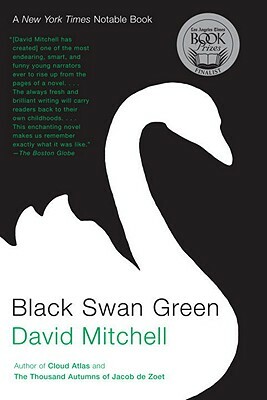 Pointed, funny, profound, left-field, elegiac, and painted with the stuff of life, Black Swan Green is David Mitchell’s subtlest and most effective achievement to date. David Mitchell is the award-winning and bestselling author of The Bone Clocks, The Thousand Autumns of Jacob de Zoet, Black Swan Green, Cloud Atlas, Number9Dream, and Ghostwritten. Twice shortlisted for the Man Booker Prize, Mitchell was named one of the 100 most influential people in the world by Time in 2007. With KA Yoshida, Mitchell translated from the Japanese the internationally bestselling memoir The Reason I Jump. He lives in Ireland with his wife and two children.